~ The lofty side of this is that I am a mom on a mission. I am striving to create a better world by being the best, most inner-directed mother I know how to be. The other side of this is that I became a mom… on purpose. Meaning, I chose this. But man, it can be hard. This morning my Nanny passed away. ‘Nanny from Newfoundland’, as she is referred to in our household. And while I am deeply saddened, and feel the grief from our large, extended, Canada-wide family, there is a part of me that keeps a little smile among the tears. No matter what she may have appeared to be as a ninety-five-year-old woman – I’ll tell you what she actually was: formidable. After all, at ninety-five years of age, she was still living at home on her own up until a few short days ago. Even with the events of this past year, when against all likelihood, she healed well from a broken hip in the fall, was walking again without assistance, and even got off of the oxygen tank. At 95 years of age, I have to shake my head in wonder. You see, underneath her unassuming appearance lay one of the most determined and pragmatic personalities imaginable. She called life as she saw it, and there was never any false pretence. With my nanny, what you saw was what you got. She cared about the simple things in life and with her, family was always first. As for her own needs, she simply wanted to be at home, in her own bed, and eating her own food. And making her own decisions – as she was fiercely independent. As a matter of fact, her pragmatic style has long been a source of amusement in our family. For years now when anyone would speak to her about any future plans, her oft-repeated response was, ”Sure, I might be pushin’ up daisies by then, bye!” (imagine this in a strong newfie accent) So of course, when my sister called to tell her that she had booked flights to visit in June with her three girls, that was the expected response. It was a flippant way of stating the truth – that we never know what life is bringing us – and that on her end, she had come to terms with life and her eventual passing. The smile in my heart is also from admiration. Admiration for a woman who was strong, who knew her own mind, kept her razor sharp wits about her at all times, and was at peace with life and ‘meeting her Maker’. I remember our first scare with her was over 12 years ago, when she had congestive heart failure. I remember planning my wedding that year, anticipating that she wouldn’t be around to see it. AND I remember her remarkable turn around – so that I can also remember her sitting at my wedding, full of life, and writing in our guest book that maybe she’d just stick around long enough to be a great-grandmother. Which she did. Twenty-seven times over – I might add (and one more on the way). Yes, my Nanny was a fighter. She lived through world wars, hardship and change. She lived through raising eight kids, losing a husband early on in life, and burying one of her grown sons. In recent years, she has been in and out of the hospital several times – but each time she rallied. And she returned to living at home on her own: which was exactly where she wanted to be. Not surprisingly, our family has always rallied around her. She has never wanted for care, phone calls, or visitors. In recent months and years, my mom and siblings have arranged their lives to have someone in Newfoundland with her keeping her company, and taking care of any business at hand (which Nanny didn’t always make easy, I might add!… she liked things all done her way) But the love they all feel for this remarkable woman made it a simple decision for her children to fly from all parts of the country to spend weeks at a time with her. 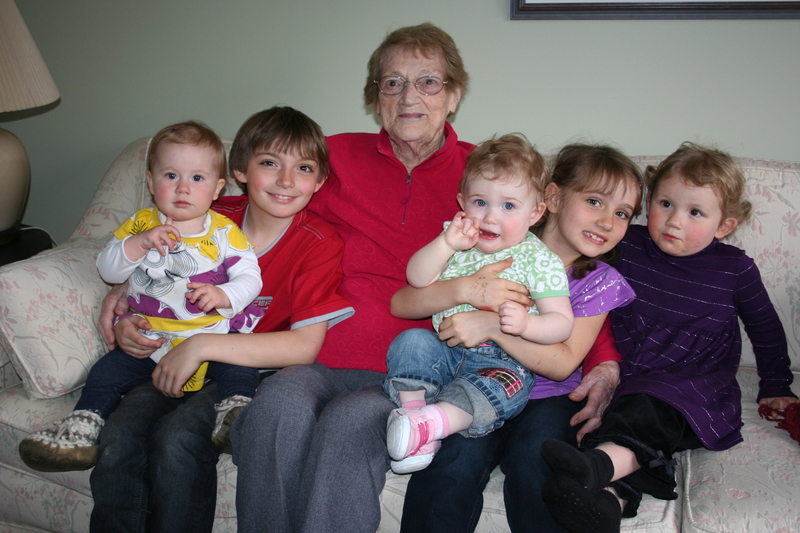 She enjoyed visits from her grandkids and great-grandkids from all across Canada. Quite simply, I think she lived for that. I know, because I saw how she was filled with life and laughter simply by being around her great-grandkids. 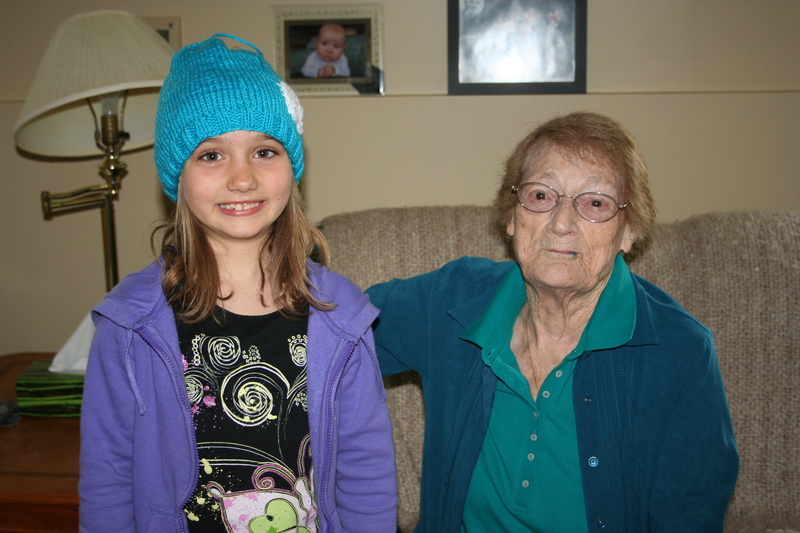 The last time we saw Nanny was two years ago when I flew to Halifax with Ethan and Audra – expressly for the purpose of having them meet and remember their great-grandmother. It was one of the best family visits in my memory, and one that I will cherish forever. You see, everything my Nanny did was genuine. There were no contrived appearances: with her, you get what you see. But underneath the slowing body and wrinkled skin was a mind of steel and an enormous heart. Family meant everything to her. But this time, she was ready to leave. Now, I was not there, and that was told to me second-hand. But I can vividly picture Nanny – calling the shots right until the end. And I imagine – with the intuitive sense of truth – that she knew that this was her final goodbye. I imagine that she knew that she had just slept her last night in her own bed, and eaten her last meal at her own table. I imagine that she knew as she crossed the threshold of her house – the home she had lived in with her husband, the home she had raised their eight kids in, the home whose walls were filled with many decades of memories and several generations of laughter – I am certain that she knew that this was the last time. And in this simple way, she showed her immense courage. It was in this simple, peaceful way that she lived her life. When I picture this, I am filled with awe for her simple courage, and with peace for knowing that she passed on her own terms. While she may have said that ‘she’d go when her Maker called her’, I have a sense that with her strong and determined mind she somehow managed to set it all up to her liking nonetheless. My Nanny died in her sleep last night. And while she may not have had many people present at the time of her passing – I assure you that she was absolutely surrounded in love. With great love, sadness and joy, today we say our final goodbyes. I am so very sorry to hear the news that your Nanny has passed on. I feel like I knew her through the many stories I have heard over the years and, hence, feel your loss. Neil and my prayers go out to you, your Mom and your entire family! I also want to express how well you have written your tribute to your Nanny. I was in tears reading her final decision to leave her house for the hospital…I could almost feel as she had at that time and how brave she really was! xoxoxo I crying Amy! Because I can feel the love you have for your Nanny and clearly she taught your family some of that love! I can see YOU in how you describe her!! I think we are the lucky ones who get to MISS a grandparent who was actually important in our lives! xoxo to you all!!! Thanks Pip. You brought tears to my eyes at the idea that what I most admired in my Nanny are traits that friends see in ME. (: And I agree about being grateful for grandparents! 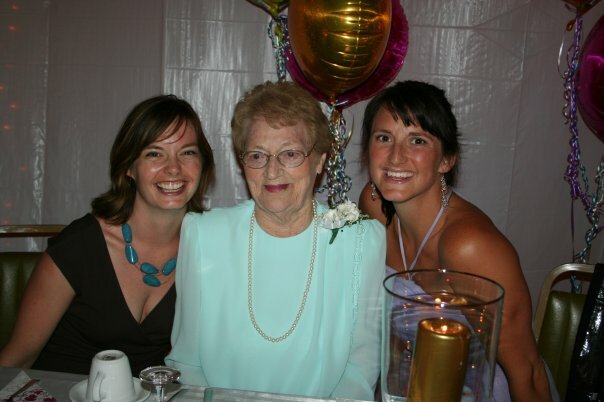 Nanny was my only living one for all of my life, and the world feels a little changed somehow with her gone. Funny how love works (: And family. Thanks, Judy. I’m sure you were privy to many stories and memories of Nanny over the years! Audra was pleased to see that she was in 2 of the 3 pictures, of course! Hello this is Brenda Lois Bruce Niles sister-in-law….Lois was happy she got to see your mom before she passed. She said that her mouth was dry Lois offered her gum and she greed that is what she needed. Lois couldn’t find any in her purse so she went to the vending machine with her twonie and he gum got stuck in the machine. Lois pulled out another twonie and one pack came out. Lois gave this to her aunt her moms sister and she chewed and told her that did h job! Lois loved her. Very much and had great conversation with her prior o coming back to the states. Lois had a big smile on her face when she talks bout her and I know that you guys have lost someone very special! Take care and carry on her attitude for life! Brenda prayers to your family! So sorry to hear of your Nanny’s passing. What a lovely tribute to her. I was glad to have “met” her again last summer while mom and I were in Newfoundland. I wish I had half the energy and determination she had. She will be greatly missed by all of you. I’m sure we will be going to Halifax in the near future so will get to visit with your mom but, in the meantime, please pass on our sympathy to the Power clan. Thanks Terry, I will pass your comments on. I do have to say that I’m happy to see such strong, long-lived women (like your mom!) on both sides of my family tree (: All the best to all of you. Amy, I had the honour of meeting your nanny last summer. Please pass on my love and condolences to your mom and all of the family. I am Jose’s sister Anne’s only daughter. This was the most touching thing I have read. This was the Aunt Jose I knew and loved. Thank you for sharing with all of us. Amy you are a talented writer and have done a wonderful tribute to celebrate your Nanny’s spirit and her life. My husband, Peter and I met her a few times at Rose’s in Calgary and found her to be a fun and memerable person. Amy, your nanny was my Aunt Jose. My father was Bern, the youngest of the Murray clan. It has been many years since I have seen Aunt Jose, but I loved her dearly. She always managed to come for a visit when she was in NS with your Mom. I could, and did, sit for hours and listen to her stories. Her voice is still very clear in my memory. When we were little, our Nanny Murray used to knit us socks and mittens, and after she died I think Aunt Jose “adopted” us in a way…she put us on her knitting list. I have a pair of grey knit socks in my drawer that must be at least 20 years old. I don’t wear them, but I will always have them, simply because I know Aunt Jose made them. I love Christmas and I am still one of those people that sends Christmas cards, not the pre-printed cards and labels, I sign and address each one. As much as I enjoy sending them, I love receiving them. One thing I can count on each year, is that one of the first cards to arrive will be a card from Aunt Jose, and that means the world to me. We have a large extended family, there are more than 60 Murray cousins, so the fact that she thought enough to send me a card each year was so special to me. Maybe she sent a card to everyone, but each year when I open it, I like to believe I am the only one and it makes me smile. I am sad to know there will be one less card next year. I will miss her dearly. She was a special person in my life. I am so sorry for your loss. My love to your Mom. Hi Sherry – thanks so much for sharing those memories and thoughts. I have many myself from our childhood visits to your family home – and many of your dad’s smiling face. All I can say is, “What a family!” All the best. The lofty side of this is that I am a mom on a mission. I am striving to create a better world by being the best, most inner-directed mother I know how to be. The other side of this is that I became a mom.... on purpose. Meaning, I chose this. But man, it can be hard. Real life. Fully expressed. And not always Inspired. The lofty side of this is that I am a mom on a mission. I am striving to create a better world by being the best, most inner-directed mother I know how to be. The other side of this is that I became a mom... on purpose. Meaning, I chose this. But man, it can be hard. MY JOURNEY. MY PURPOSE. MY PASSION.